School leavers applying to English universities will get more data about courses under government plans to treat them more like consumers. A food labelling-style system will flag up teaching hours, career prospects and seminar frequency, says the Department of Business, Innovation and Skills. On Tuesday, it will announce a new framework for higher education. The plan aims to set out priorities for universities ahead of a review of the way students fund their education. Tuition fees were introduced in 1998 and Business Secretary Lord Mandelson believes this entitles students to act more like consumers. He has said government and industry must scrutinise and monitor courses on behalf of students, encouraging "a greater degree of competition between institutions" to drive improvement in courses. His department already publishes statistics on employability after six months and three-and-a-half years, but the latest plans would put information in one place. This could include graduates' typical future earnings, contact hours with tutors, assessment methods and frequency of tests. Universities are lobbying to be allowed to increase course fee levels - capped at £3,225 for 2009/10 - while student representatives have complained that this would deter bright scholars from poorer backgrounds. 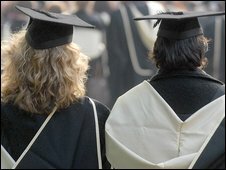 Up-front tuition fees were scrapped in Scotland in 2000, although Sir Andrew Cubie, who led a review proposing their abolition, recently suggested graduates should pay for their education. For Welsh students at universities in Wales, a subsidy covers all but £1,255 - though this may end. Students in Northern Ireland face similar charges to those in England.